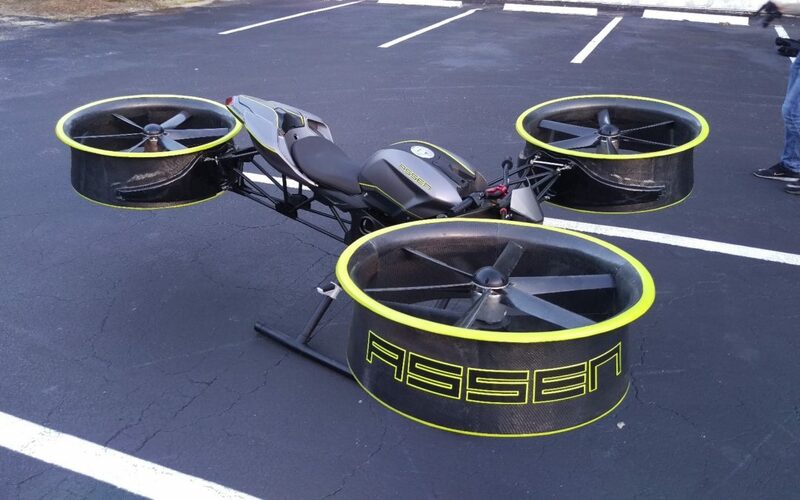 Assen Aero successfully flight tested a prototype of their A1 Hoverbike. A video posted to Youtube earlier this week shows the bike flown remotely at low altitudes. This is the one of the first steps towards full scale technology demonstration, which may include Hoverbike races as early as next year. Assen Aero, based in South Florida, has been working on this aircraft for two and a half years and is confident they are on track to schedule. The A1 is a hybrid-electric vertical takeoff and landing (VTOL) aircraft combining a gas-driven piston engine and three ducted electrical fans for quiet lift. Focused on safety and reduced risk, the aircraft has a top speed of about 60 mph and can climb to an altitude of 4,000 ft. Assen’s CEO and founder justifies this moderate performance as a stepping stone for the emerging VTOL/air taxi technology. “We believe that the way to influence social acceptance is by removing the risk from the public and so we have focused on the leisure and extreme sport application as we believe these vehicles will blend more naturally into people’s lives in these roles” says Andonov. Learn more about Assen Aero, the A1, and founder Assen Andonov in episode two of Flying Car Podcast here. More information about the A1 can also be found on Assen Aero’s website or on our aircraft page. Why it matters: Assen Aero is demonstrating confidence in their A1 prototype as excitement surrounding VTOL aircraft and Hoverbike racing grows. Flight tests depicted in their recent video show the design is progressing towards commercial readiness, planned for 2019.